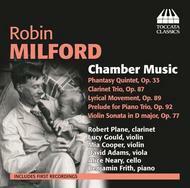 The revival of interest in the music of Robin Milford (1903-59) has largely bypassed his exquisite chamber music, an omission this recording seeks to redress. It presents some of his most attractive compositions for chamber forces, showing his very personal - and very English - combination of melodic freshness, elegiac lyricism and echoes of folksong. The clarinettist Robert Plane has been described as the 'current occupier of the shoes of the late Thea King in his championship of British clarinet music'. Two couples perform on this recording: Robert Plane is married to the violinist Lucy Gould and the cellist Alice Neary is married to the violist David Adams. Robert Plane has been principal clarinet of the City of Birmingham Symphony Orchestra and the Royal Northern Sinfonia and, now, the BBC National Orchestra of Wales. The Gould Trio - Lucy Gould, Alice Neary, Benjamin Frith - is one of Britain's best-known piano trios, touring internationally and recording frequently. They are also active as teachers and coaches, principally at the Royal Northern College of Music and the Royal Welsh College of Music and Drama where they hold residencies. Mia Cooper is leader of the RTE Concert Orchestra in Dublin.